Step by Step has been around for over 25 years, teaching thousands of people across Greater Wellington Region. 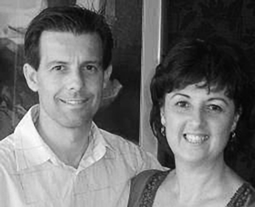 The founders of Step by Step are Cheryl and Rob Stevens and have trained many of the Wellington dance teachers. Cheryl and Rob hold Fellowship Qualifications under the New Zealand Federation of Dance Teachers (NZDFT). They have represented New Zealand in World Class Ballroom and Latin American dance competitions. Both are Executive members and Examiners for NZDFT. Over the years more teachers have joined Step by Step, bringing their own skills and personalities into the studio. You will be sure to find a teacher that fits your learning style. What dances do I learn? Learning to dance is something special that lasts a lifetime. It should be fun, friendly and sociable. Waltz, Tango, Foxtrot, Viennese Waltz and Quickstep. Cha Cha, Samba, Rumba, Paso Doble and Jive. This can be choreographed from one of the dances above, or a mixture.